Travo has since the 5th and 4th millennium BC (the Neolithic) been continuously populated, as an important site on the road that connects Piacenza and Genoa. Since the 1980s, excavations are carried out by “La Minerva”. There are Roman remains, as well as a Romanesque church and a castle, originally dating to the 12th century. The cultural research group “La Minerva” (Gruppo di Ricerca Culturale La Minerva) was founded in the 1970s in order to help identify, detect, protect and promote cultural heritage, archaeological and historic present in the province of Piacenza. The Group works voluntarily and freely with the relevant bodies and in particular with the Superintendence of Archaeological Heritage of Emilia Romagna. The Group also makes use of archaeological specialists for the implementation of educational activities related to the Archeological Museum and Park, and the conduct of archaeological excavations. The main activities nowadays are reconnaissance (finding new sites), excavation, handling the archaeological museum in the Castle of Travo Anguissola (since 1997), restoration of archaeological artefacts, cultural activities to raise awareness and promote historical knowledge for all age groups and finally the archaeological park where La Minerva is involved in education activities since September 2006. The site of the archeopark is actually an original archaeological site, first investigated in 1995 (and still ongoing). The main feature of the park, covering about one hectare, is the preservation of a view of the prehistoric structures. The Neolithic Village of San Andrea in fact is partly preserved, parts of which are visible: several dwellings are being conserved on site. The locations of the original poles are made visible. Also, there is an ancient wall of dry stones. 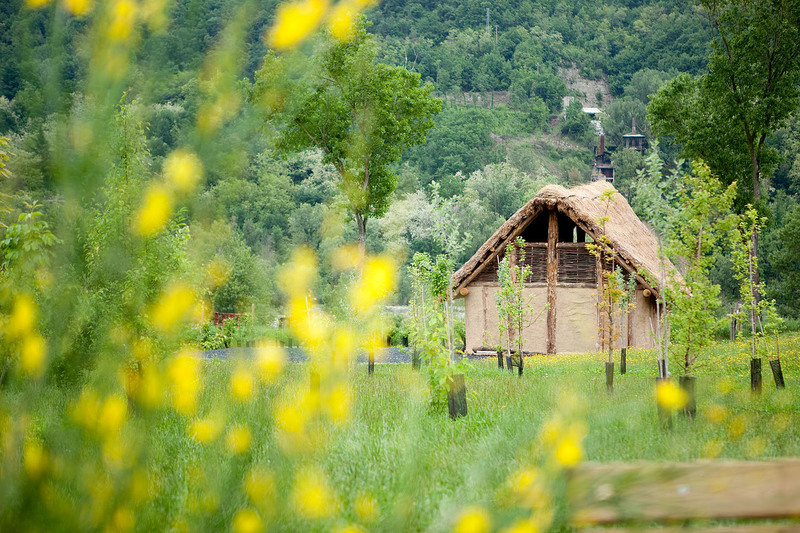 These dwellings were inspiration for building new ones on site, designed by Riccardo Merlo, complete with a roof thatched with reed like how one thinks the original ones were done. There are regularly themed events to show ancient techniques like making and using ceramic pots, flint knapping, weaving and cooking. There is also a simulated archaeological excavation with remains of poles, pits and ovens where you can be archaeologist for a day. The education activities are aimed at acquiring knowledge about the archaeological practice (research and excavation surface), the methodologies for the study of materials (ceramic, stone, wildlife, plant remains) and the interpretation of the remains and archaeological data. To classroom practices are associated with specific activities of experimental archaeology. The park is also accessible for physically impaired. Modern facilities include a bookshop. Since my college years I have been concerned with the Neolithic sites of my region, among which Travo, a town located in the in the Middle Trebbia Valley, in the province of Piacenza, Italy. Between 1998 and 2008 I worked with archaeological co-operatives, carrying out emergency digs. Since 2008, I am the director of the “Archaeological Park” and the “Archaeological Museum” of Travo, developing both the educational programmes related to schools and the scientific activity related to the Museum. I published some scientific articles about the Neolithic sites I had been involved with, and I now work with the Archaeological Authority (Soprintendenza ai Beni Archeologici) of the Emilia-Romagna Region and with the Italian Institute for Prehistoric Studies (Istituto Italiano di Preistoria) to realize scientific projects.. I have been working in the branch of scientific restoration since the year 1997, together with the restorers from ICR, in several locations in Italy (Rome, Florence, Mantua, Venice, Verona, the Carthusian Monastry of Pavia, etc.). Most of my professional experience is related to the archaeological restoration in situ and in Museums. Since 2006, I have been involved in the development and management of the Archaeological Park St. Andrea, at Travo by Piacenza (Italy). I contributed to the realization of certain structures and to their divulgation. For some years I have been coordinating the educational activities of the Park. In 2009 I got the qualification of “ecological project designer”. Claudia Minuta attends to Conservation and Restoring of Fresco Paintings, Murales and Stone Opuses. She evolves Training Organisation of local staff employed as conservation officer of Monuments and Fine Arts in developing Countries. In 1997 Degree of Set Designers at Academy of Fine Arts of Brera in Milan and the certificate of Technician of archaeological restoration, conservation and maintenance (I.A.I. ): in 1999 Certificate of frescoes and stone materials (C.E.SV.I.P). Since 2006 member of La Minerva, she plans archaeological workshops and educational programmes.